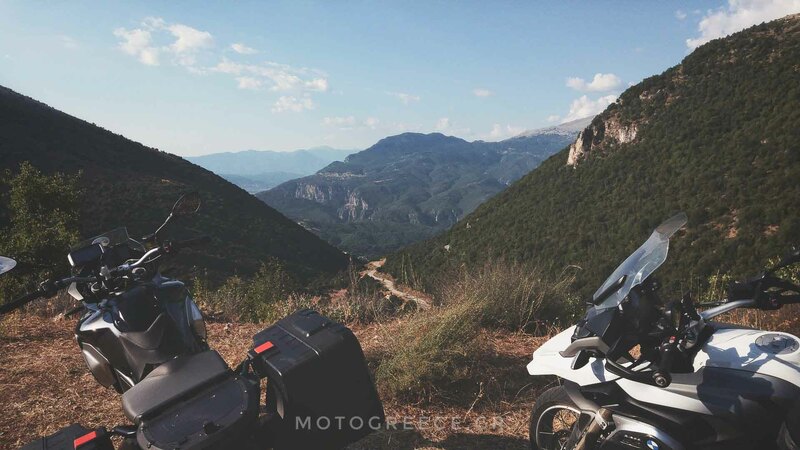 In this blog post we show you how to exit Athens fast and easy with your motorcycle, using our base as a starting point. Some clients get worried when they first see on the map our location. MotoGreece is located in a central area of the capital, and this makes it look intimidating or frustrating to someone who does not know how to get away from the traffic jam of the big city. you will have to pay a toll, of 1 euro and 40 cents (as of January 2018, last price update). But it is definitely worth it. You will avoid all traffic madness and you will save lots of your precious time, which you would rather spend on enjoying the riding rather than getting mad negotiating traffic. 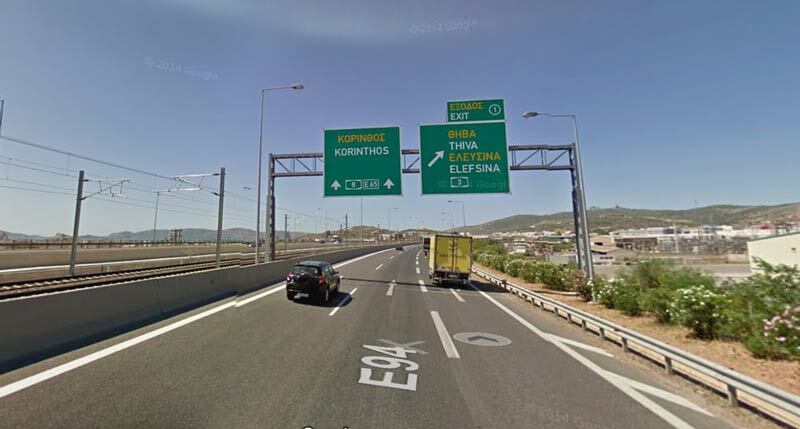 Ymittos ring road (“Y1”) is a modern motorway that bypasses part of the eastern capital and intersects with “Attiki Odos” (“6 / E94”), the other major ring motorway. These two roads will allow you to reach easy to 3 major exit points, from where you can continue you trip towards any direction: to the south (to Peloponnese for example), or to the central or northern Greece. The distance from our base to the ramp that will bring you on to the Ymittos road is 4.2 kilometers ( 2.6 miles) and the average time it takes to get there is … 8 minutes on a motorcycle ! 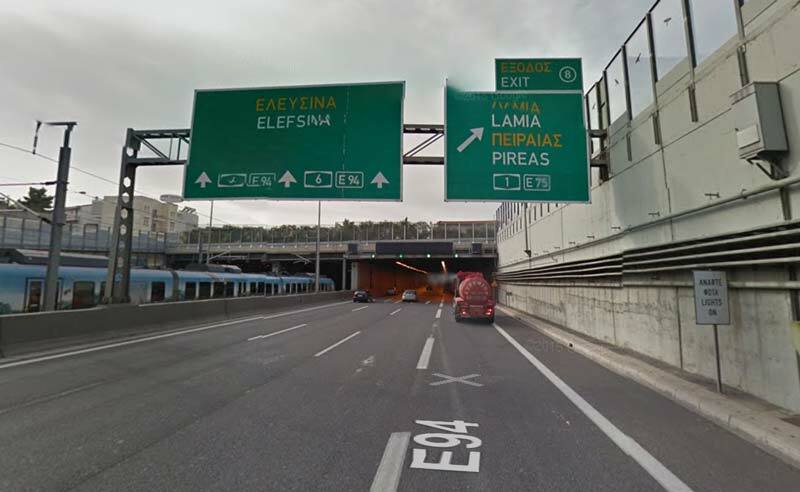 Once you get on the ring road, you should follow the green signs that read “ELEFSINA“. Note: you are not going to Elefsina! But that is the general direction you have to follow. In the following screen capture from google maps, point A is our location. Point B is the exit ramp that will get you on Ymittos ring road. From that point, the arrow shows the general direction of travel on the motorway, that will bring you on the next 3 exit points, that we discuss next. Map directions to exit Athens from MotoGreece offices. Then, where to next ? On the previous screen capture we marked 3 more exit points. To central Greece via country roads, no tolls. Next point in the direction of travel is exit number “1”. Take that and follow road “E962” if you want to travel towards central or northern Greece by following country roads from as early in you trip as possible. The next and final point shown on the map is where you continue south towards the Peloponnese region. At that point you have 2 options. 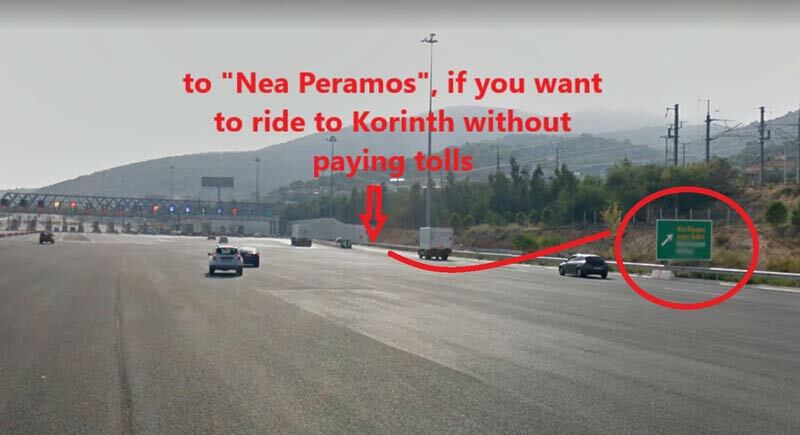 First is to simply continue as you are, via tolls, on the motorway “E94” all the way to Korinthos (also spelled Korinth, or Corinth). So, there you have it ! With these instructions you can leave behind the traffic congestion of Athens and not loose time.